Longfellow wrote "Christmas Bells" in the winter of the third year of the Civil War, shortly after receiving news that his son Charles Appleton had been critically wounded during the the Mine Run Campaign. I wish you all to have a peaceful Christmas, or whatever holiday you chose to celebrate. Majmudar, who is a poet and a physician, grew up in the Cleveland area. He earned a BS at the University of Akron and an MD at Northeast Ohio Medical University. His poems have appeared in many places, including the New Yorker, The Antioch Review, Poetry, The Norton Introduction to Literature, and The Best of the Best American Poetry. He's the author of two collections of poetry, 0′, 0′ in 2009 and Heaven and Earth in 2011, and his new collection Dothead will appear from Alfred A. Knopf in March, 2016. Cleveland.com features 13 Great Independent Bookstores in Cleveland (and surroundings). For bonus points, visit them all! Join the winter club: We’re hunkering down, writing, revising, and sending out our stuff. Here’s a helping hand for the next two months on where to send everything from a book manuscript to flash fiction, from dark fantasy to surreal free verse. Presses and journals can write to Dennis James Sweeney to be included on the next list. Or, if you’re keen to be involved with this one, feel free to write a comment below. Welcome to Literistic for December! "How I thought/think about poems..."
Nice imagery in the post by Susan Grimm about writing poetry, in her blog "The White Space Inside the Poem"
"I was trying to write a poem that was solid, all of a piece, weighty as a stone that I could drop into the vast water of a reader's attention. There would be that satisfying plop noise and then the rings travelling out all the way to the invisible beyond...."
Joy Lanzendorfer, in The Atlantic, articulates some of the reasons I'm so disquieted by literary journals that charge reading fees to look at submissions-- "a practice that’s bad for the writing community at every level," as she says. "While most journals are still free, every few months, a new journal seems to announce that it’s going to start charging writers to submit their work—a trend that’s slowly threatening the inclusivity of literature when it comes to new, diverse voices. "...To make matters worse, being poor is already the norm for writers. A recent industry survey showed that more than half of writers earn less than the federal poverty level of $11,670 a year from their work. I know what this feels like. 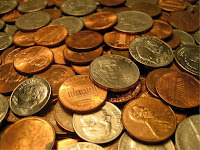 There was a time when I made two cents per word as a writer and worked part-time as a waiter to pay the bills. I lived in a bad part of town, slept on a blow-up bed, ate on a card table, and owned a 1978 TV with a broken channel changer that I had to turn with a pair of pliers. When that was my life, these fees would have added up so quickly that I couldn’t have afforded to write fiction at all." Read the whole article here: "Should Literary Journals Charge Writers Just to Read Their Work?." Clevelandpoetics: the blog is a community effort. We want you to help! Really: we want your contributions. We need your contributions. We value your contributions. If you've ever wanted to contribute, and were just waiting for an invitation: here's your invitation. The blog is open to the community, and you are invited to contribute. Join the team! 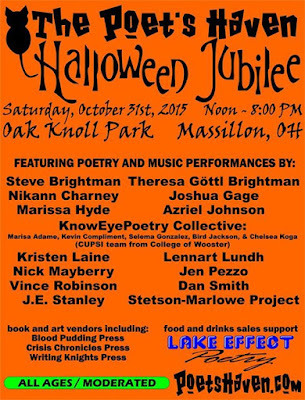 Every year there are new voices in the Cleveland poetry community, and we want to hear them. Do you have anything to say about the poetry community? 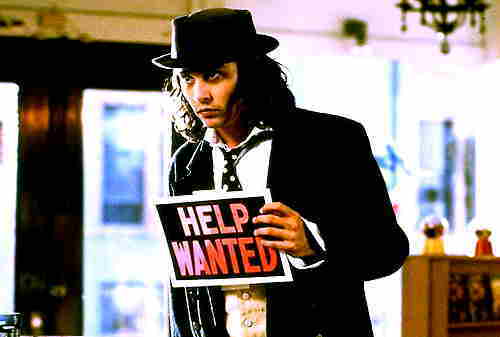 We're looking for contributors! Do you go to poetry readings, want to make comments on the local poetry scene, want to share your opinions on contemporary poetry? Join us! We want you to tell us about writing, tell us about reading, tell us about the poetry scene, about your obsessions, who you like, who you hate, how poetry should be. Tell us about writing in our sports-obsessed, poetry-infested, hot-blooded city, or about anything you think fits somehow in the Cleveland Poetics topic. It's as much work-- or as little-- as you like. Write a post when you have something to say, or don't if you don't-- there's no minimum activity. Know somebody else who you think would be a good blogger? Pass the invite along! If you'd like to join the blogging team here at clevelandpoetics, we're open: leave a note in the comments. Or drop me an email at clevelandpoetics@gmail.com and tell me you want to be a blogger. Here's your chance to express yourself, and contribute to the community. Join the team! 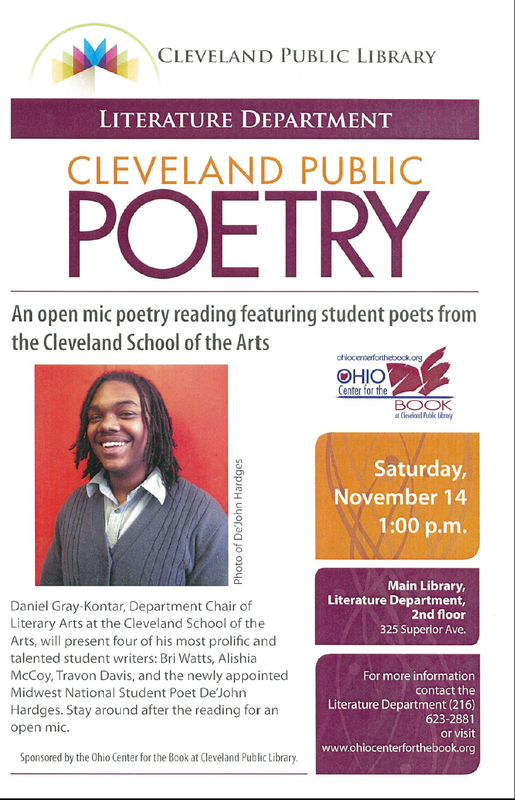 Daniel Gray-Kontar, Department Chair of Literary Arts at Cleveland School of the Arts, will present four of his most prolific and talented student writers: Bri Watts, Alishia McCoy, Travon Davis, and the newly appointed Midwest National Student Poet, De'John Hardges. After the students' readings, there will be an open mic. Presented by Ohio Center for the Book at Cleveland Public Library. 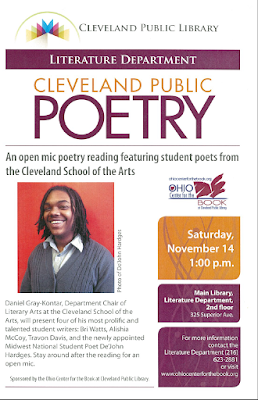 Saturday, November 14 at 1:00 p.m.
Main Library, 325 Superior Ave. The New Yorker has an article "the curious persistence of poetry shops": book stores that specialize in poetry, and how they are surviving, and even in a small way thriving, in an era in which many large bookstores have been failing. "Retail may not get much more niche than poetry, which historically has never been a lucrative proposition. But it does have cachet in some circles, and a dedicated readership. The best poetry stores mix the scholarly with the whimsical, the linear with the arty. Berl’s is in a former gallery space, subleased from two artists, with exposed brick walls that have been painted white, barrel ceilings, a gray Lego sculpture of Walt Whitman, and an eighteen-chair area for readings. On one wall are seventy black-and-white portraits of anarchists and monarchs by the artist Miranda White, Jared’s sister, with whom he has collaborated on a book." 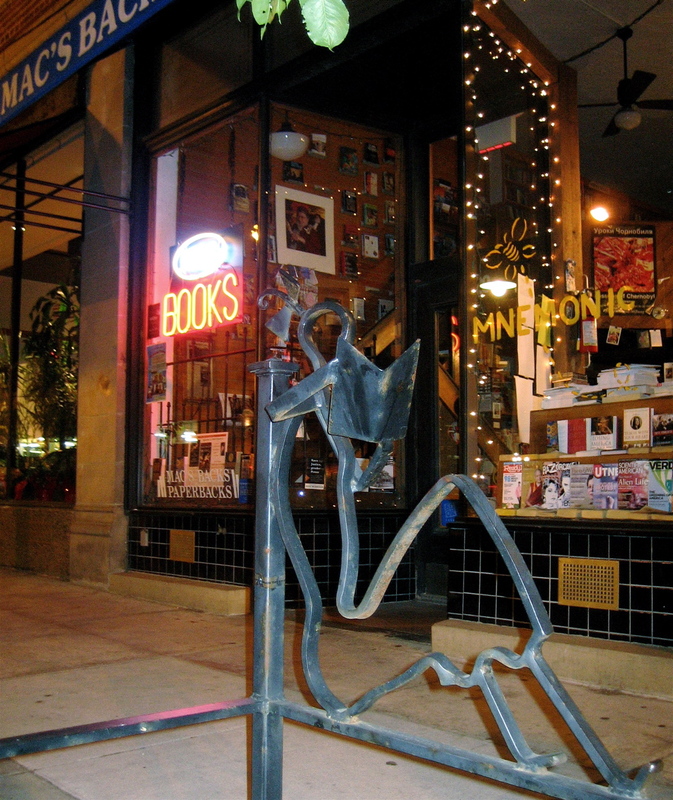 They somehow fail to mention Cleveland in the article, but we do have a few bookstores that are very friendly to poetry, particularly notably Guide to Kulchur and Mac's Backs. -- and we've got art, too.